Native Regalia is NOT a Costume! When I was younger I saw other girls wear a Native American-themed dresses for Halloween. Their dresses had a fringe and at the bottom it had a blue zig-zag line. After seeing this, I asked my mom why my traditional dress didn’t look like the other girls’ dresses. People should learn the difference between a costume and regalia because not knowing the difference confuses kids; regalia has a purpose; and wearing our regalia is a part of our identity. 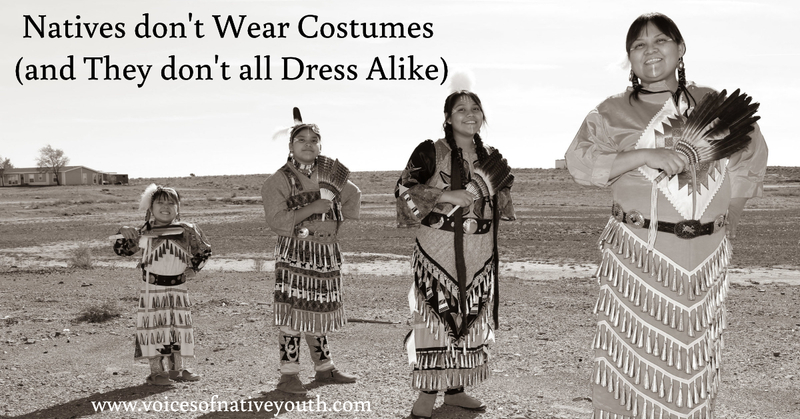 Did you know when other people dress up as “Indians” it could confuse Native kids? According to Jovannah Poor Bear-Adams, a Lakota Sioux, her son questioned his identity as a Native American because he saw kids at a Vacation Bible School program where they had an “Indian” theme and wore fake war bonnets. Since he didn’t dress like that, he wondered if was really a Native American. This story tells about one Native child’s confusion, imagine how many other kids are confused about their identity. No doubt other kids are asking their parents if they really are Native American. My grandma argues that dressing up as a Native American can confuse all younger kids. For example, a young non-Native kid could get the wrong impression about Native Americans and think they are all the same because of an “Indian” costume. As a result, that kid could tell a Native child that he doesn’t look like an Indian and ask questions that would confuse the Native child. In other words, people dressing up as ‘Indians’ for simple activities or TV shows could leave an impression on Native kids and might confuse them. He went home he asked his grandma about the costume situation. As a result she explained how Native regalia told stories and history. Our regalia is important because is shares stories and we also use it in our dance groups. The dictionary points out that a costume is something that a person wears when they are on stage or when a person dresses up as another person. Therefore, a costume is when you dress up as something you’re not. For example dressing up as Spider-Man is wearing a costume because you’re not actually Spider-Man. All in all, our regalia is not a costume because our traditional wear is a part of us and defines who we are. Our regalia has a big part in helping us rediscover our identity. Anthony O’Neal acknowledges that every teen is trying to discover their own identity and how they fit into the world. Now imagine going to school and seeing a white girl dressed in a “Pocahottie” costum. What would you assume about Native girls? These comments lead me to question who I am. All in all, teens or other young Indigenous kids are trying to find themselves and you’re not helping by dressing up as one. Native American’s regalia is not a costume. Doing simple things or just watching certain TV shows could confuse any child. The regalia that Indigenous people wear defines who they are and you shouldn’t make fun of their heritage. Teens or other Native kids are trying find their identity and the regalia plays a really big part in helping them understand their heritage. In short, it’s not okay to dress up as a Native American nor should you call regalia a costume because it’s important to us Native youth. Isis is a small human being who is Navajo and Mexican. She’s an anime lover who likes pizza hot pockets. A pet peeve is when she sees someone’s shoelace tucked in and the other side is hanging out. What are the Struggles of a Native Youth from a Single-Parent Household? I appreciate hearing this distinction between costumes and regalia. I learn from listening to your perspective. Thanks for teaching us. Isis, thank you so much for informing other people about this situation, I really hope others take something from this. Thank you very much for explaining this so thoroughly. Wonderful article. A lot of people, including those up high in our country, could really use this information! Thank you for this! I’ve never really thought about it, though I did know that different tribes wore different regalia. Most of the time for Halloween, I always dressed up as something I wasn’t. Now that I have kids, I think a little harder about why they dress up as certain things. For example, my boys usually dress up as a superhero or a character from a TV show or movie they like. But sometimes they dress up as things they already are. One year, my oldest son was taking karate, and he dressed up in his practice gi. He told everyone he was dressing up as a ninja. He was not a ninja yet, but he was taking steps to learn how. Another year, he dressed up as a basketball player. He hadn’t played much basketball, but he was dressing up as someone he wanted to be. If someone who is not Native American wanted to dress up like one, how could they do that? Where can they buy your traditional regalia? Should they not dress up as Native Americans at all? What about cowboys? I grew up in the west with real cowboys around, and they don’t all wear the same thing. But there is a stereotype that fits as something recognisable to everyone. Should we just say that no one should want to be a cowboy or a Native American? I don’t know. Food for thought. Thank you for speaking up and allowing people to hear your perspective. Bringing awareness to the issue is a great way to get people thinking!